My family loves, Loves, LOVES visiting the park! Right now, my youngest daughter can't get enough of the swings. Last year, my oldest daughter was obsessed with the monkey bars. My boys are braver with each visit, climbing higher, sliding faster, jumping off farther! (Yikes!) Parks are places where all my children are happy together which makes Mom and Dad happy too! I love that every park is different, each with its own personality. 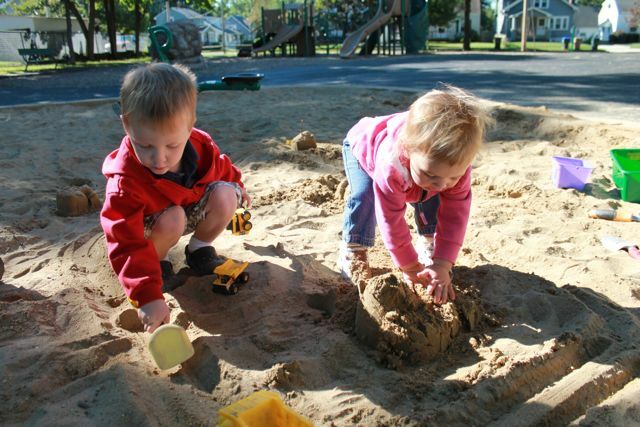 My children have given their own unique names to some of them -- Pirate Ship Park, Fire Truck Park, Wooden Park, and Scary Park (My wife and I named that one because the equipment is so high and tall that it freaks us out!). My children know other parks by their proper names and can tell you all about the special features at each. S.O.A.R. 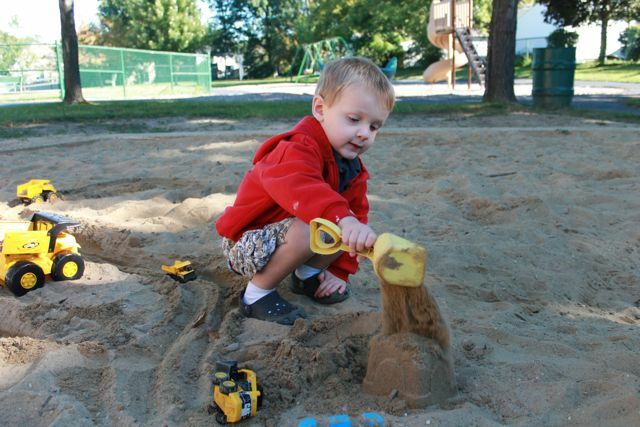 Park is the newest one with the latest and greatest equipment. 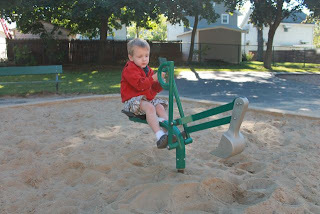 Oak Park is the park that was closest to our old house, where we have visited the most, and it has a teeter-totter! Sunny Lake is the park that has a huge path around a small lake to ride bikes. 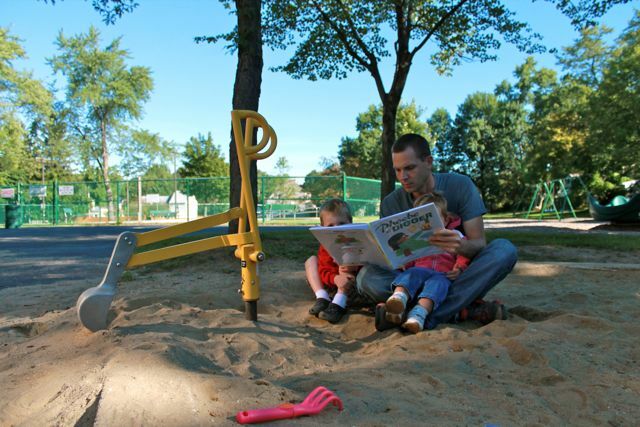 This week, after celebrating Tricia Springstubb's birthday, my youngest two children will be adding a new park to their list of favorites because it has an awesome digger play area. The story of Tricia Springstubb's writing career can be told in two parts. In the 80s and 90s, she published numerous books for children and the young adult market including Two Plus One Makes Trouble, which sold over 100,000 copies (Greenhouse Literacy). Then, Tricia decided to focus more on family and writing for adults. She described this time in her career, "Spread thin. I never quit working on children's stuff, but I went unpublished. Longer than, at this writing, I've let myself definitively calculate. I never stopped thinking of myself as a writer, but evidence grew thin." (Cynsations). Part II of her career came in 2010, when she published her middle grade novel, What Happened on Fox Street, which received numerous awards including Ohioana Juvenile Literature Book Award and numerous Best Books of the Year awards. Around the time Tricia released the sequel to Fox Street, Mo Wren, Lost and Found, which was equally as successful, I was lucky enough to meet Tricia through SCBWI. She shared her birthday me but I had to wait two years for her to publish a new picture book to read with my young children so we could create a family reading experience. 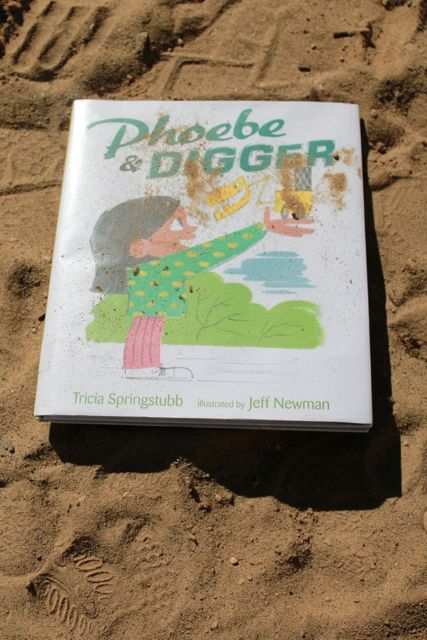 This past March 2013, Pheobe and Digger, illustrated by Jeff Newman, was released by Candlewick Press and it was definitely worth the wait! This week I read Phoebe and Digger at least fifteen times to my children, but the first time was at the park. It is a picture book that can be read anywhere, but reading it in the dirt and sand made it that much more memorable. Phoebe has a new baby in her family which takes up most of her mom's time. 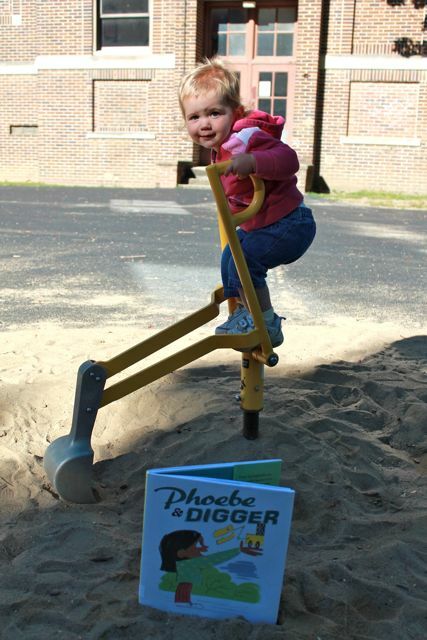 Luckily, she got a new digger when her mom got the new baby. Digger could not be more cool (RMM! ), but the baby could not be more annoying (WAA!). It is tough being in a house with a new baby and Mom believes a visit to the park could really help everyone. 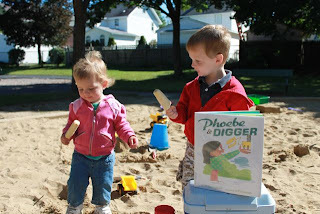 Initially, the park is awesome -- Mom and baby are happy and Phoebe and Digger are playing in the dirt -- until, a crybaby's cry triggers exactly what Phoebe's mom was trying to avoid, MORE CRYING from all the little ones at the park! It goes from bad to worse after Phoebe has a timeout and a big bully takes Digger. Luckily, after some timely interventions Mom, Phoebe, baby (and Digger!) end up having a pretty good day at the park. My two youngest children and I found a nice spot in the dirt and sand to read Phoebe and Digger. It could not have been a more perfect morning. Don't you just love cool mornings in September? My girl and her digger. The last time we were at this park he was too little to work this digger. This time, he did great at scooping and dumping. You should have heard his realistic sound effects! We brought our diggers, dump trucks, buckets and shovels. 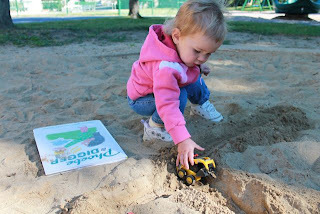 In the book, Digger builds a mountain and "knocks it to smithereens." 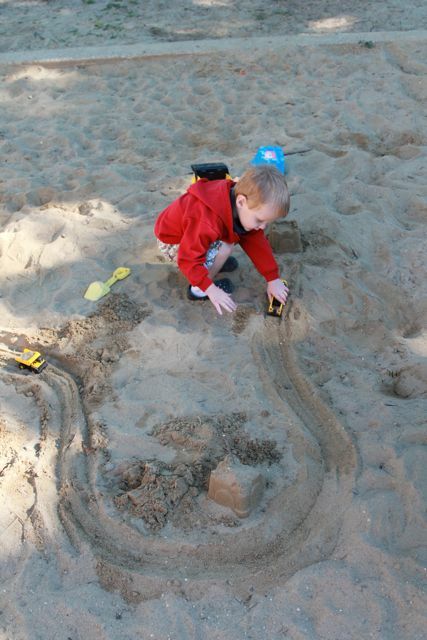 My little digger piled on more dirt to crash down the buildings we made. 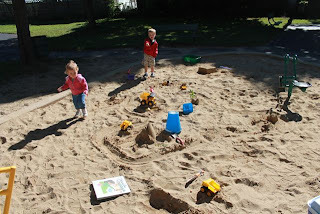 We built a road just like Digger. Our buildings didn't last long. RMM! 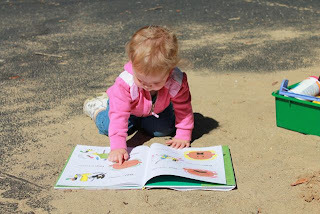 My daughter loved the baby in book! WAA! I thought my children would play with the diggers and trucks for about 15-20 minutes. Boy, was I wrong! We were building roads and buildings all morning! I should have packed a lunch! However, I did pack frozen treats. You'll have to read the book to find out why we did that. 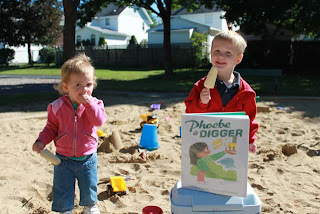 A great book, diggers and dumpers, perfect weather, and a frozen treat. I think it was a day my son "wished would go on forever." Tricia, thank you so much for sharing your birthday memory! My family hopes you have a wonderful birthday that it is filled with reading, writing, family and friends. Thank you for writing a picture book that made a huge impression on my young children!